What is the difference between a Screen and Tab Recording? How do I select microphone and camera inputs for the GoVideo extension? What does the GoVideo "Slow Connection" status mean? How do I recover a GoVideo recording that failed to upload? Can I share my GoVideo recordings through applications other than Gmail? How do I sign in to GoVideo with a different account? Can I download my Vidyard GoVideo recordings? How long is the GoVideo sharing link available for? Why do I need browser cookies to sign in to GoVideo? One of the primary features of GoVideo is the ability for you to understand who has watched your videos and for how long. 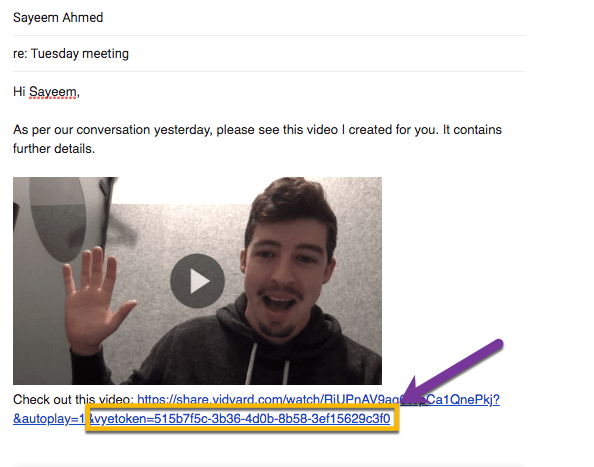 Wherever you use GoVideo, an alphanumeric tracking token is added to the video URL when an email recipient is indicated. This allows GoVideo to associate an email address with a person's viewing behavior. Videos shared to social media or through messenger apps (SMS, Slack, etc) will not contain a tracking code. As a result, any views that you receive will be unidentified. *Note: In both Gmail and Outlook, GoVideo will not remove the tracking token when a Salesforce or HubSpot email forwarding address is added to the BCC field. These emails are used to relate correspondence to lead or contact records in your CRM. View notifications can be found in both GoVideo Chrome extension and the GoVideo mobile app. The mobile app will also send a push notification to your phone.